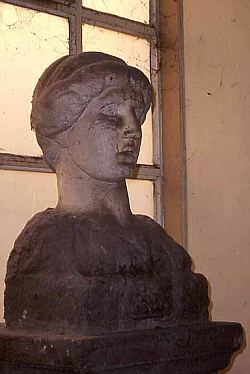 This bust of the siren, Parthenope, is said to have been recovered from the area of the acropolis. It is on display in the Naples city hall. If you stand facing the Church of San Pietro a Maiella at the western end of via Tribunale (the main road of old Greek "Neapolis"—number 40 on this map) and turn right, you will be facing north; your line of sight will run almost directly along the line of the old Greek wall (a portion of which is excavated at nearby Piazza Bellini) that led up the hill to the highest point in the ancient city, to the spot where the acropolis stood. I have recently come across references to a plan for an "urban park" that would include that highest spot of the old city. The plan would lay bare the area of the acropolis and clear away a large number of nearby buildings; thus, visitors could, so the theory goes, stand where the Greeks once stood, on the height of the northwest corner of the old city, and get a feel for what it must have been like to look down over the city wall to the valley and hills beyond. Thus, again the theory, a valuable piece of the history of the city will have been recovered from the all-destroying juggernaut of progress. In order to see just how bizarre this plan is, you just have to look around. Your line of sight from that church on via Tribunale to the spot of the ancient acropolis is today completely obstructed. First, there are the buildings of the First Polyclinic Hospital and an adjacent parking lot. Those facilities occupy land reclaimed from the demolition of the 16th-century convents of S. Maria della Sapienza and that of Croce di Lucca ( a small bit of which was left standing—#39 on the map—in the square adjacent to the parking lot). The hospital was built in the early 1900s and is still an important health care facility and medical school. As you move up the street, directly behind and above those medical buildings is what used be the large convent of Sant'Andrea delle Dame, built in the late 1500s, and later converted into part of the medical school. It is, itself, an important part of the cultural heritage of the city. Behind that, at the very top of the hill, is the Church of S. Aniello a Caponapoli. It is first mentioned as the site of a small monastery in 1058. It sits presumably on the spot where the acropolis stood and is currently being restored. Beneath the church are pieces of the Greek wall, some of which have been excavated and will again be on display when the church is reopened. All of those buildings —hospital, ex-monastery, church— are on the left-hand side of the street as you go up. On the other side are more medical buildings, churches, and a fire station. At the top of the hill, at the Church of S. Aniello a Caponapoli, if you now turn right to face to the east and walk along what was the northern wall of the Greek city, along the cliff, you are of course flanked on the left by modern buildings along the hyperactive modern street, via Foria, below you. Those buildings are higher than the cliff itself! In other words, you look out as the Greeks must have looked out. but you can't see a thing except the backs of modern buildings, one of which is the mammoth Salvator Rosa High School. One newspaper article describes the plan: "They will tear down —something they should have done long ago— that horrible school that covers the area of the acropolis and the fortified wall from the 5th century, b.c., on the slope overlooking [what is now] Piazza Cavour. The plan also calls for the demolition of some of the buildings of the old Polyclinic hospital...The goal is to create a 'green' pedestrian zone and an archaeological park..."
The idea is insane. Tear down even a portion of a good hospital? A high school? All of the high city of ancient Neapolis is now irrevocably obscured by the urban growth of centuries. A large urban archaeological park is out of the question. I can envision, perhaps, a limited series of underground mini-sites, each one burrowed out beneath a building and each displaying remnants of Greek walls and temples. At the most, you might expand on what has already been started just a few yards from the church at the top of the hill; that it, there is now a very small excavated area that lets you look down at a portion of the old wall that has been reconstructed (photo, right). The site is adjacent to the Department of Psychiatry of the hospital. That may prove convenient for those who came up with this idea in the first place.